Altmetric for Scopus is a powerful 3rd party web application that runs within the sidebar of Scopus article and abstract pages. It's a quick and easy way to see all of the social or mainstream media mentions gathered for a particular paper as well as reader counts on popular reference managers. 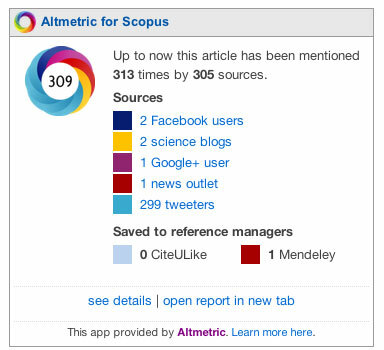 The Altmetric application is currently installed for all Scopus users by default (you can choose to disable it if you wish) but will only appear in the sidebar when there is data available for the article that you're currently viewing. You can usually find it underneath the "Related Documents" box on the right hand side of the screen. Altmetric watches social media sites (e.g. Twitter, Facebook, Pinterest, Google+), science blogs, many mainstream media outlets (including the NY Times, The Guardian, non-English language publications like Die Zeit & Le Monde and special interest publications like Scientific American, New Scientist) and reference managers for mentions of academic papers. It cleans up this data, enriches it and then allows authors, readers and researchers to see it in context. Though not every article is discussed in public online Altmetric tracks around a hundred thousand mentions a week, with some three thousand new articles seen a day.